Started by a team of industry experts, BeautyGlimpse is the destination for unbiased and expert beauty advice, home remedies, beauty tips, deals and fashion trends all in one place available to you 24 hours a day, seven days a week. 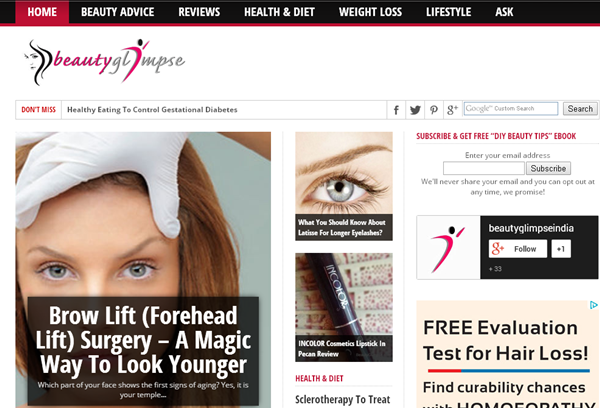 BeautyGlimpse is a beauty, health and lifestyle portal wherein you will find lots of articles that you might be searching on internet. The layout of the website is simple, neat and easy to navigate. There are separate tabs for beauty advice, reviews, health and diet, weight loss, lifestyle and ask the experts. You will find lots of beauty advises provided by beauty experts related to hairstyles, hair care, skincare, makeup, nails, bridals, eye and many more. I really enjoyed reading DIYs’ on BeautyGlimpse. Not only did they provide information on makeup and beauty but everything that a woman needs. There is also a section for health and diet where there are really inspiring articles related to health, diet and fitness. If you are searching for weight loss articles then I will surely recommend you to check BeautyGlimpse as the posts are written by experts in simple language. There are various articles containing natural ways to lose weight. You will also find Lifestyle section containing articles related to fashion, food, travel, work and life. There are various beauty tips that you can find easily on BeautyGlimpse. If you are a foodie then you must definitely check it out. It contains various yummy food recipes that look worth trying. I am fond of homemade and DIYs and was delighted to find so many articles related to making face masks for different skin types and hair masks. Being a beauty blogger, I always look for reviews before buying a product and to my surprise BeautyGlimpse also provides beauty products reviews. The reviews are in detail and are written by the members. BeautyGlimpse contains everything that a beauty and lifestyle portal should have but the best thing is its ‘Ask BeautyGlimpse’ feature. Here you can ask your query related to beauty, lifestyle, health, weight loss, work and life, fitness, cosmetic surgery, DIY and everything related to women. The answers would be given by experts which is really appreciable. Not only that you can also subscribe to their email list and get “DIY Beauty Tips” eBook for free. • Lots of detailed articles related to beauty, makeup, lifestyle, health and weight loss. • Lots of product reviews to choose right product for your skin. • ‘Ask BeautyGlimpse’ is a very useful feature that allows you to ask your queries to experts. • BeautyGlimpse is started by a team of experts. • The site gets updated frequently. • You will find lots of trending articles under one roof. • Provides free DIY Beauty Tips EBook. • Being a nail art lover, I would love to see nail art tutorials that are missing in the website. BeautyGlimpse is a one stop destination for everything related to women’s interests. It covers almost all topics that a girl usually searches for. It contains articles related to beauty, makeup, health, lifestyle, weight loss, DIYs and many more. The quality of the articles is superb and I love how informative they are. If you have a query in your mind, you can use Ask BeautyGlimpse by posting your query and it would be answered by experts. Overall I totally adore BeautyGlimpse.com team for their efforts and would definitely recommend this website to you. 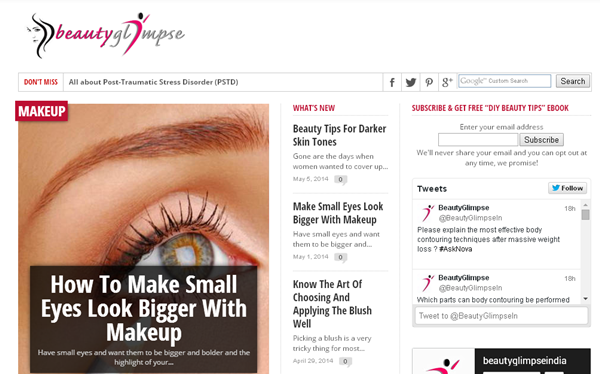 Have you checked BeautyGlimpse? Did you like it? Share in the comments section below!